This could just as easily be creator/director/writer Mike Flanagan (who brought us the outstanding Hush… and, uh, some less outstanding chillers) talking to his audience. Netflix’s The Haunting Of Hill House is takes its title, its character names, and some of its grand trappings—but not much else—from the singularly sinister Shirley Jackson novel. Is this adaptation “respectful”? Like almost everything in Jackson’s barely navigable Hill House, that depends on where you stand. Adaptations, even of justly legendary works, have to take liberties. It’s crucial to bend the story to fit its medium. What Flanagan does, though, is to discard the story and start almost from scratch. The series premiere opens with a voice-over of that famous first paragraph (“Hill House, not sane, stood by itself against its hills, holding darkness within”), altered to make it the monologue of Steven, oldest son of the fractured Crain family. “Steven Sees A Ghost” repeatedly nods to the novel, festooning the screen with images lifted from the book: the ominous statues of Hill House, the looming spiral staircase, the maze-like corridors and expansive grounds. Even the Dudleys, gloomy caretakers with a proprietary air, show up, and Mrs. Dudley (Annabeth Gish, suitably buttoned up and forbidding) delivers the famous “in the night… in the dark” speech. They’re small markers and monuments to the original story, but they do nothing to usher in the oppressive, ambiguous terror that animates Jackson’s story, or Robert Wise’s 1963 film adaptation, or even the hilariously overblown 1999 fiasco. Netflix describes the series as “a complex family drama wrapped in a chilling horror story.” In the pilot, Hill House is both those things and neither. Family drama? Check. Horror story? Check. But it’s neither complex nor chilling. It’s a numbing web of predictable (if internecine) family conflicts punctuated by jump scares. Let’s pause and get our bearings. (It’s easy to get lost in Hill House, though Flanagan’s version hasn’t given that impression yet.) Let’s talk about what works in this episode. Young Steven (Paxton Singleton) has the too-knowing look of an oldest child whose intelligence and certainty are bolstered by his parents’ constant support. Played by Lulu Wilson, Shirley (you see what they did there) is a cheerful older sister, barely begrudging her younger siblings’ invitations to play; adult Shirley (Elizabeth Reaser), an undertaker with a knack for calming kids and adults alike, so resembles her mother, I did a double take. Young Theodora (Mckenna Grace) broods with her books, adult Theo (Kate Seigel, star and co-writer of Hush) parties hard and sets hard boundaries. Most of those boundaries are for their drug-addicted brother Luke (Oliver Jackson-Cohen, his shaking hands and guilty eyes a sad evolution of the bespectacled urchin he was, played by Julian Hilliard) and little sister Nell. As a child, Nell (Violet McGraw) was troubled by The Bent-Neck Lady (a character, creature, or fantasy fabricated for this adaptation). As an adult, she’s more troubled still, and in the premiere, it’s Nell’s death—unfortunately telegraphed and predictable to the point of cliché—that promises to bring this fractured family together. The sets of Hill House, seen in flashback, are old-fashioned extravagance grown suitably shabby with the passage of time. The great spiral staircase, more staggering even than the wobbling set seen in the 1963 film, is a grand showcase appropriate to a mansion of the time. The richly patterned wallpaper, dark wood, stained-glass windows, and lush grounds of Hill House are both luxurious and oppressive. The expansive grounds feel both freeing and worryingly vast. It’s a grand old house, and at times a weirdly grim one, and a house that was destined have a ghost story attached to it. The sets are haunting. The acting ranges from perfectly competent to touchingly honest. The visuals and sound—especially the jump scares, of which there are plenty—are thuddingly predictable, as are the putative twists presented in this first episode. The last scene intends to deliver the big scare the episode’s been saving up, but when Nell opened her plaintive mouth and unleashed her horrified roar, I laughed out loud. The beats of this story—this dreary family drama dragging down what looks like the same old haunted-house tale—are just too familiar, and too glossy, to pack a punch in the introduction. That’s doubly true in the present-day scenes, almost all set in houses reeking of bland affluence. The episode relies, maybe too much, on flashing back to the Crain family’s youth. But at least the flashbacks have some texture, visually and emotionally. The Crain brood are standard-issue horror-movie kids, but at least their standard quirks make them endearing. The adults that Steven, Shirley, Theo, Luke, and Nell have grown into are, frankly, a little dull at first glance. Depending on where you stand, Mike Flanagan’s adaptation—and here, adaptation deserves italics, if not scare quotes—is audacious, or maybe just careless. If you were expecting the poetic patience of Shirley Jackson, a story of strangers coming together in a labyrinth of a house where their particular quirks converge into a half-sexual, half-familial tension, Hill House could be a grave disappointment. 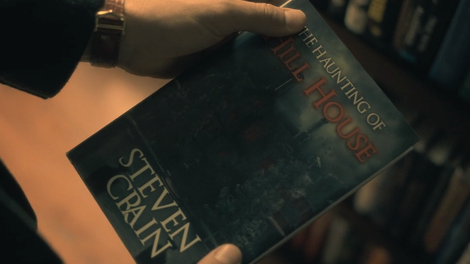 This is a story so thoroughly reimagined that in the first few minutes, Steven—a character who doesn’t even exist in the book—holds a copy of The Haunting Of Hill House with his own name in the author’s credits. I’m not suggesting that we should always judge an adaptation for what it isn’t instead of what it is. But when it strays so far from the source material so quickly, it’s worth asking why it’s an adaptation at all. Despite the occasional glimpses of Hill House’s grotto or its sculpture gallery, its forboding staircase and forbidding housekeeper, there’s little connection to the lyrical complexity of Jackson’s story, to its emotionally rich, often bleak ambiguity, to its—yes—haunting sorrow and rage and grief and resentment. There’s a bitter irony here. 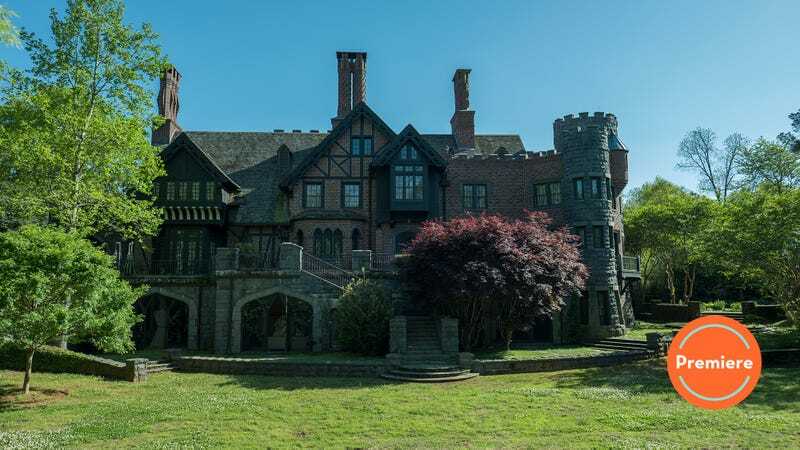 The original Nell longs for connection at any cost, and she fights to find it within the grim gates of Hill House; the Netflix series tosses away almost every connection to its inspiration straight out of the gate. Making this series in this way has a cost, too. There’s an extraordinary show to be made from this peculiar, potent novel. Instead, for this year, for this generation, we have another slickly anonymous ghost story weighed down with a predictable family drama. Judging by “Steven Sees A Ghost,” Mike Flanagan’s The Haunting Of Hill House is slick, stylish, modestly spooky… and kind of a shame. I find myself hoping Irene will say no. Shirley Jackson never had the chance to. Welcome to The A.V. Club’s coverage of The Haunting Of Hill House! I’ll be publishing episodic reviews hourly all weekend (four episodes Friday morning, three Saturday, and the final three on Sunday), so please be mindful of spoilers for future episodes as you discuss the series in the comments. Thanks for reading! Shout-out to Saidah Arrika Ekulona as Irene Walker, who brings visceral grief and horror to her introduction, describing her husband’s death and the dreadful visitations that came after. I look forward to further Shirley Jackson adaptations from Netflix, with as little connection to their source material in the premiere episodes. My elevator pitches: The Lottery, in which Tessie Hutchinson hits the jackpot (the Jacksonpot?) and pulls up stakes from her stuffy small-town life for carefree life in the big city, and We Have Always Lived In The Castle, which is just Game Of Thrones with a new title slapped on.